The following essay is reprinted with permission from Duke Anesthesiology at Duke University School of Medicine. 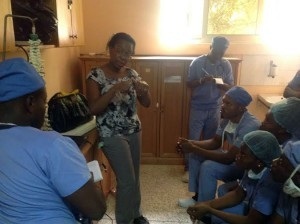 Chief Obstetric Anesthesia Fellow, Amy Mauritz, MD describes her trip to Africa as part of the ongoing Global Health mission of Duke Anesthesiology. To be honest it was very hard to reconcile in my mind the abundance of resources we have at Duke to the scarcity of basic medical necessities that are available at Ridge. Observing this inequality was my harsh introduction into the difficulties associated with improving maternal mortality worldwide. Despite these obstacles, it was extremely satisfying to collaborate with dedicated local physicians, nurses and trainees to brainstorm and execute sustainable solutions that will work in their environment to put an end to preventable maternal deaths. The partnership between Kybele and Ridge Hospital has drastically improved maternal care since 2007, but our work will not be finished until there isn’t a single mother that suffers a preventable death. With the help of our very own Dr. Olufolabi and Ridge Hospital staff, I was able to implement a modified obstetric early warning system at Ridge Hospital. This system will aid in the early recognition and treatment of deteriorating parturients. My hope is that by giving the nursing staff parameters to identify declining patients early and by empowering them with a system to summon help from senior physicians, sick parturients will be treated early in their disease process and morbidity and mortality will decline. The enthusiasm and support of the MOEWS that I received from the staff at Ridge Hospital is indicative of the warm hearted and loving nature of the Ghanaian people. I felt this warmth both inside and outside the hospital. 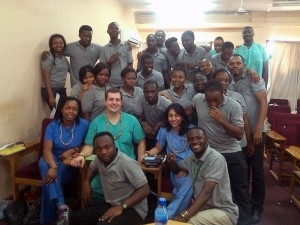 I am grateful that in addition to my time at the hospital I was able to experience the beautiful culture of Ghana. 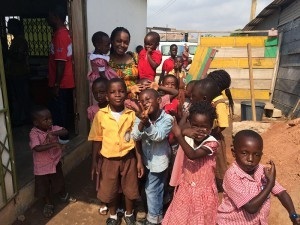 I spent time exploring the Kakum National Park, Elmina Slave Castle and walking through the historic fishing town of Jamestown learning about the daily lives of the women I saw every day at the hospital. I am grateful to the Department of Anesthesiology for supporting my trip and for all the individuals in the department who support Kybele financially. I am also grateful to the Society for Education in Anesthesia and Health Volunteers Overseas for sponsoring my travel. I encourage any resident who is interested in global health to apply for the SEA-HVO traveling fellowship to financially support your experience. I assure you that you will return profoundly changed!